When the bus slowed, squealed, and shuddered to a stop, Howard absently rose and headed to the doors. "Hey." He stopped. "This isn't a bus stop. What's going on?" he called up to the driver. The driver was peering out into the heavy rain of the grey city. Lightning lit the streets, showing Howard a large stray dog shivering on the sidewalk. Before any of the passengers said anything, the driver walked out into the rain and put a hand on the creature's head. The mutt didn't move, as though it expected neither kindness nor cruelty from humankind, only perfect indifference. Rain obscured the gradual change until it couldn't be overlooked, making it seem abrupt. The driver's skin sprouted fur of the same grey-brown as the hound. Howard's bemusement turned to shock. The dog's fur also changed, turning smooth and chocolate brown, growing larger and rising to its feet even as the driver shrank. A moment later, a new driver boarded the bus, similar to its predecessor but clearly distinct. "Sorry for the delay. Let's get y'all back on track." Howard watched the dog in the rain as the bus left it behind. It looked soaked, hungry, ignored... and satisfied. Okay, so I flip the muffin tin over—it's just an ordinary muffin tin, see?—and I flip it over like this. You watching?" The shadowed figure in the corner of the kitchen nodded, a minute incline of the head. Marie hesitated, then continued. "So I take this" she took an awl from a drawer, "—and punch a hole in the bottom of the muffin mold. Like this. You want to be careful. If the point slips, you could cut... nevermind." She repeated the process on each of the eleven remaining muffin molds. "And now, voila!" Marie flipped the tin back over and showed off a muffin tin with holes punched up through the bottom of each mold. She presented her best smile, and held it until she couldn't hold it any longer. "I'm sorry." She looked at her feet. "I thought I could keep this going. I probably should have gone for the chess thing." YOU'RE NO GOOD AT CHESS. "No, but it might've taken longer." She sighed. TIME IS RATHER IMMATERIAL AT THIS POINT. Marie nodded. COME. She walked toward the cloaked, skeletal figure. BRING THE MUFFIN TIN. IT REALLY WAS A NOVEL TRICK. Marie smiled with real joy. This was it. The finale of the global television phenomenon Dance Planet Earth. The dance team from France had finished, to thunderous applause. Now, it was the Russians' turn to perform for the largest audience in history, predicted to include over one-point-three billion people watching live. Dancers took their places, struck their opening poses in the dark, and the light came up on movement. They moved in perfect time and rhythm, marking out flawless geometric shapes — concepts, even — with their choreography. Across the world, viewers shuddered as they felt like the temperature had dropped twenty degrees. Without any foreshadowing, the dancers broke from geometric perfection and shifted into something that looked like utter chaos, beautiful in motion but unrestrained. The dance looked unplannable, yet somehow they stayed in time and their movements still complemented each other. Around the world, people shivered and hugged themselves or their loved ones tight, eager for heat but unwilling to leave their televisions before the dance was complete. People in places that had never needed heating found themselves in the middle of an emergency. From their sanctum in the the motherland, Russian sorcerers celebrated, and plotted their conquest over a world of ice. "Yeaaaaah, smash him, smash him!" Roger cheered so energetically he sloshed beer out of his cup. Moments later, one of the opposing team slammed number 14 hard against the glass, and he sank down on the ice. When his teammates helped him up, he skated slowly to the bench, holding his arm tenderly. Roger yelled as 14 passed his rinkside seat. "Ahhh, what's wrong, can't take a little pressure? Soon as the game gets rough, you need to sit out? Want me to call your mommy?" Waaah!" Little known in the hockey world is the devotion of the Hindu deities to the sport of Hockey. It began when the Canadian traveler Vernon Morely found himself stranded in Punjab and, bored, arranged a hockey competition. At this very moment, Shani sat in the audience admiring the Canadians' skill. His eyes narrowing, he looked at Roger from across the rink and whispered. Despite the distance, Roger heard each word clearly. "No. For your shameless disregard for this noble game, I pass judgment on your karma. You shall suffer in the next life, which begins... now." Roger alone heard the cry of a raven, as he transformed instantly and painfully into a pig. Parents Put a GoPro on Toddler During Hide and Seek. Watch What They Find Out! "Okay," Erin said, "it's loading. Now shhhh." John stifled his giggles and held up his wife's phone. On its screen, they watched a bobble-headed first-person view of their home. Their home through the eyes of their toddler. The perspective wobbled down a hall decorated with an earth-tone carpet and family photos. It peered into the master bedroom, and Erin hushed John when he whispered, "She's almost found us!" But the camera went past the closet that hid them and peered into the bathroom, then retreated. It looked into the child's room, then the powder room, and finally the kitchen. "What...?" Erin muttered. The view showed two tiny hands pushing a stool over to the drawers. The child stepped onto the stool, then opened the drawer with a series of small jerks. A toddler's hand pulled out a butcher's knife. "Oh, my God." Erin tore open the closet door and ran for the kitchen, John on her heels. Racing into the kitchen, they found their child sitting, quietly burbling. The knife was gone. John rewound the recording, then reached into the back of a cabinet they barely used and brought out several knives. "I told you I wasn't losing our knives." 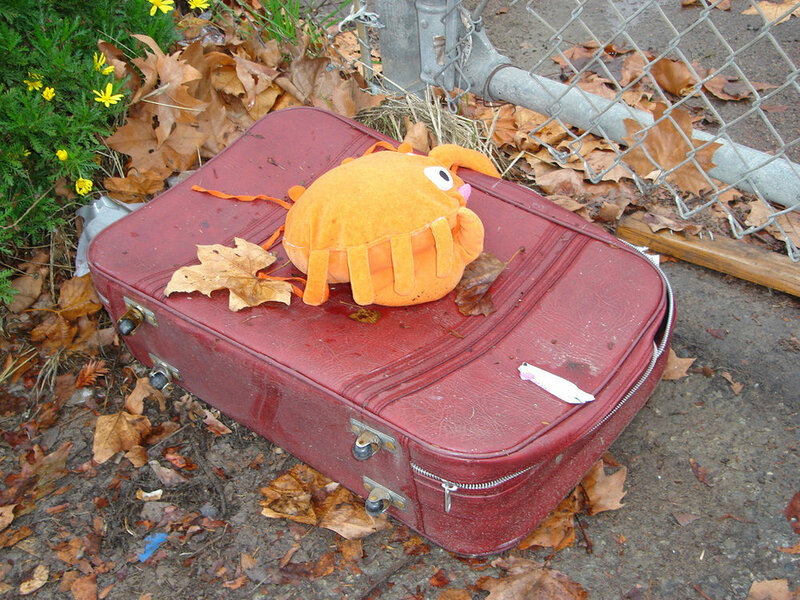 She Found an Abandoned Suitcase outside Her House... You'll Never Believe What Was Inside! Jenine parked in the driveway. She couldn't wait until Garry cleared out his junk and she could park in the garage again. She stopped three feet from her door, because a suitcase barred her way. It sat on her stoop, dingy, outer fabric worn, without any nametag that she could see. Scowling at it, Jenine saw one of the clasps was open. Squatting beside it, she undid the other clasp and slipped the suitcase open. With a gasp, she slammed it shut. Her scowl gone, she opened the suitcase again with wide eyes, this time slowly, as though she expected something to leap out. She looked into the long, dark tunnel inside, skewing off at an oblique angle and glowing with a faint, pulsing red light. She lifted the case, but saw only the dusty concrete of her front step beneath it. Rooting around inside her purse, she pulled out a tin of mints and dropped one down. Then she dropped the entire tin, watching it fall away into the distance. Tentatively sticking her own hand in, she felt a strange pull as gravity worked on her body at two angles. Then she thought about Garry's junk in the garage.